Autism Awareness Mini Lesson | The Techie Teacher® . April is Autism Awareness month! 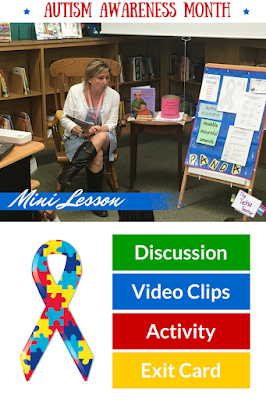 I had the honor of observing Deanna Pollard, Mehfoud Elementary's OUTSTANDING librarian, who has been teaching all of the children at Mehfoud about autism. This subject can be very tricky to discuss with little ones but her mini lesson was absolutely fabulous. I loved how she approached the topic, shared movie clips, talked about tablets being an avenue for nonverbal children to communicate and wrapped up the lesson by having the students complete an exit TWEET. I learned that in 2015 Sesame Street introduced a new character who has autism, Julia. Where have IIII been the past year??? There are a ton of awesome videos that teach others about the challenges people with autism face on a daily basis. Deanna showed the kids two of those videos. Autism Awareness from Julie on Vimeo. If you are interested in carrying out a similar lesson, here are the resources Deanna used. How do you approach Autism Awareness month?